You don’t need this book. You don’t divert every conversation back to yourself, or drop references to your achievements like confetti at every party, or regard the world and all the people in it as pawns on your own personal chess board. 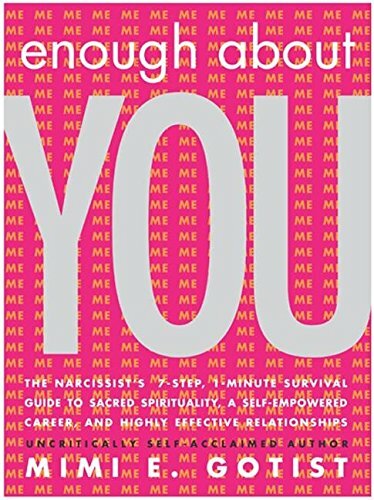 At once utterly self-absorbed and charmingly aware of it, Mimi E. Gotist has delivered a gift for our times: a way to give the narcissists in all of our lives what they truly deserve. If you can’t trust me with a child, how can you trust me with a choice? “Work is love made visible”-Kahlil Gibran. Self matters. What else does?